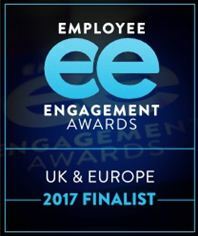 London – November 17, 2017 – The 2017 UK & Europe Employee Engagement Awards, in association with People Insight, today announces its shortlist of finalists. These are the companies that the judges believe put the employee experience at the heart of their business. The winners will be announced once again at the awards ceremony at Wembley Stadium on January 25, 2018. “It’s fantastic to see such diversity in the entrants this year. Employee engagement has become ‘business as usual’ in organisations from the very large to the very small, across every sector. There are really clever, accessible ideas in the entries which we look forward to showcasing at the Conference in March” commented People Insight managing director, Tom Debenham. HR Grapevine is the exclusive media partner in UK & Europe. People Insight are a specialist employee engagement and culture consultancy that help HR leaders make people decisions so that their organisations thrive. We deliver people surveys and visualisation, HR analytics and consultancy support. We help our clients understand what’s happening with employee engagement, wellbeing and culture, so they can make the right people decisions for real business benefit. What’s more, we provide hands-on support to make the changes that will drive results.